Outgoing postcard US-3263776 to Taiwan shows an oil painting on canvas Landscape with Peacocks by Paul Gauguin from 1892. 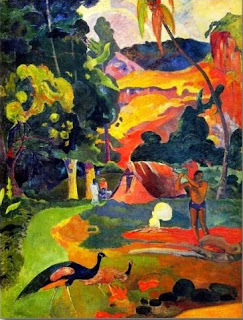 Eugène Henri Paul Gauguin (June 7, 1848 – May 8, 1903), a French Post-Impressionist artist who was not well appreciated until after his death, is most recognized for his famous paintings of Tahiti. Matamoe, or Landscape with Peacocks, is one of his most beloved works. Peacocks walk in the foreground as a Tahitian man chops wood by a fire. A hut stands in the background with two women talking below palm trees as the sunset turns the landscape orange, purple, red and yellow. Gauguin's experimental use of color and synthetist style made his paintings distinguished from Impressionism.